The room was comfortable and clean. Morning staff extremely pleasant. The room was very nice, clean and comfortable. Morning staff was welcoming, grand sons enjoyed the muffins and yogurt for breakfast. Close to family's house so easy commute between. Easy to get to off of Highway 34. The beds were really comfortable, and the climate control was good. Location and coffee pot were the only decent things going for it! It had two rooms available for my one night need and was pet friendly for my service dog. There are a mall and Walmart nearby and you can go on foot. Also there are many bus stops around the area. Super 8 by Wyndham Greeley This rating is a reflection of how the property compares to the industry standard when it comes to price, facilities and services available. It's based on a self-evaluation by the property. Use this rating to help choose your stay! 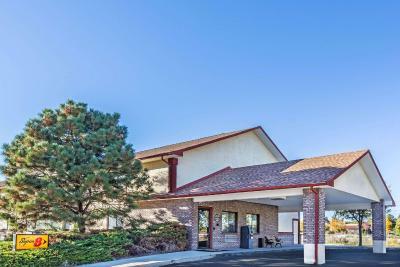 Super 8 by Wyndham Greeley is a 2-star property located in Greeley. This 2-star hotel offers free WiFi. The property provides a 24-hour front desk. All rooms are equipped with a private bathroom. Loveland is 20 miles from the hotel. Denver International Airport is 57 miles from the property. When would you like to stay at Super 8 by Wyndham Greeley? This quadruple room features a seating area, air conditioning and cable TV. This double room has air conditioning, microwave and seating area. This double room features a seating area, air conditioning and microwave. This quadruple room has a cable TV, seating area and air conditioning. This suite features air conditioning, seating area and microwave. This suite has air conditioning, microwave and seating area. This suite features a cable TV, microwave and air conditioning. House Rules Super 8 by Wyndham Greeley takes special requests – add in the next step! Super 8 by Wyndham Greeley accepts these cards and reserves the right to temporarily hold an amount prior to arrival. The person who checked me in was a rude old lady. We were pulling a trailer and the available parking for a pickup and trailer was not good at all. It would have helped if we had know that trailers were not good parking. The evening staff with the heavy accent is very rude and makes guests very unwelcome by sitting during check in, does not engage guests. Husband asked for extra pillows there are none available. Had difficulties with this same staff member last time I stayed. We stay there because it is pet friendly and close to my sons house. The receptionist was trying to charge me double when I had already paid online. My first stay there was great. This second one not so much, not so friendly, over priced. Room was very run down. Dated green carpet. Old, lumpy mattress. Funky smell when entering the room. No elevator. Was putting new carpet in hallways when we say there but our stay was good. Maybe bed way too soft for me but otherwise good. How about two extra pillows? Place is a gem. Location near Greeley Mall and other establishments. Comfortable all the way around! Has it all for the perfect overnight stay. Small fridge. Variety of channels on cable (shocking). Even a Veterans parking space! Definitely recommend it! check in was a bit of a hassle. was booked into a smoking room, not sure why. When I asked if it smelled really bad like smoke since I was traveling with a Cpap machine and two grand children she informed me "of course, its a super 8" Not a great way to represent your property. Was informed by the desk staff (Maria) could move me to a nonsmoking room for more money. When I told her I wouldn't pay more than I was quoted she then informed she was full and couldn't move me from the smoking room, I then asked if I could cancel and get my money reversed to my card, she told me that they did not charge the card booking.com did(untrue). Explained that I was a General Manager of two motels and I knew that wasn't true, at that point she magically found one last non smoking room. The worst part of the entire check in was the fact that the entire time she was dealing with me she was sitting down in a chair, not even looking at me, walked off several times. This makes any guest feel completely unwelcome. Also may want to vacuum hallways and common areas a little better. All common areas smelled of smoke.